In Part 3, Milly brought in beautiful fabrics and placed them on the sketch of the Peace Quilt spread out across a big table. Children came to her like moths to a candle, picking out just the right fabrics. At last the quilt was completed, and it was a work of art. We wrote a poetry book and the quilt was big news in town. I told ‘the world’, including the director of the National Liberty Museum. “Jennie, thank you for telling us about the quilt. I’m sure it is as stunning as your Peace Peace Portal” said the museum director.” That was so nice! She then continued. I was shocked. And here, I’d just wanted them to know all that had transpired since I saw their Peace Portal. I was thrilled. Then it sank in- a quilt from my classroom was going to be displayed – permanently – in a national museum. I couldn’t wait to tell Milly! We talked, laughed, and enjoyed the moment. Milly was pleased as punch and just as taken aback as I was. Milly didn’t bat an eye. “Take me to Philadelphia” she said, with gusto. Children and families were eager to go and be part of presenting their work to a national museum. A good sized group made the trip to Philadelphia. The director had one request. “Please bring Gloria, too. After all, the quilt was her idea.” Yes, Gloria made the trip with us. My husband and I picked up Milly at the crack of dawn. As the car went whispering along the highway in the early morning hours we chatted away. Milly leaned forward from the back seat, putting her arms and elbows up on the back of the front seat. She said, “I’m the other woman”, with a low voice and body language that meant she wanted to really talk about herself. What an icebreaker! She told us she’d long been separated and has a dear soulmate, another man. She told us that her daughter had died a few years ago from cancer, and how she’d spent every moment by her bedside, quilting. Her daughter had two young girls, and Milly was pretty much raising those girls, along with their dad. Milly talked about the quilting shop she had for years, and I learned about quilting clubs. She reminisced about life in the 1940’s. We laughed, we cried. It was the most delightful six-hour drive. We became good friends. The quilt presentation was exciting and humbling. We were treated like kings and queens. Milly was all smiles. Gloria never left Grant’s side. In the Part 3 photo, he and Gloria were checking out the quilt progress together. 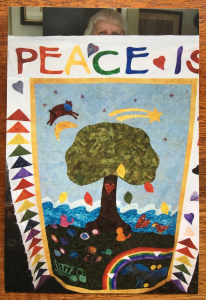 “Peace Quilt” designed by students at the Groton Community School, Groton, Massachusetts. Their teacher, Ms. Jennie Fitzkee, conceived this project after visiting the National Liberty Museum two years ago. 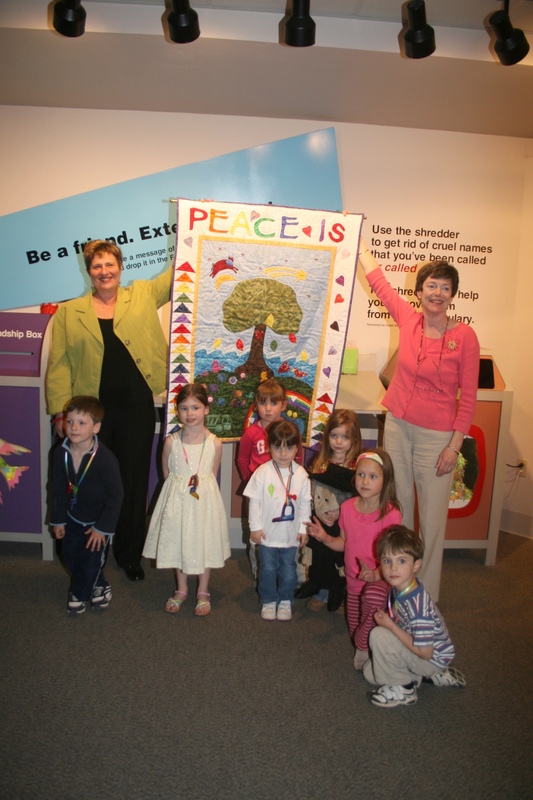 She saw many visions of peace displayed throughout the Museum, which made her wonder how her young students would interpret this concept. 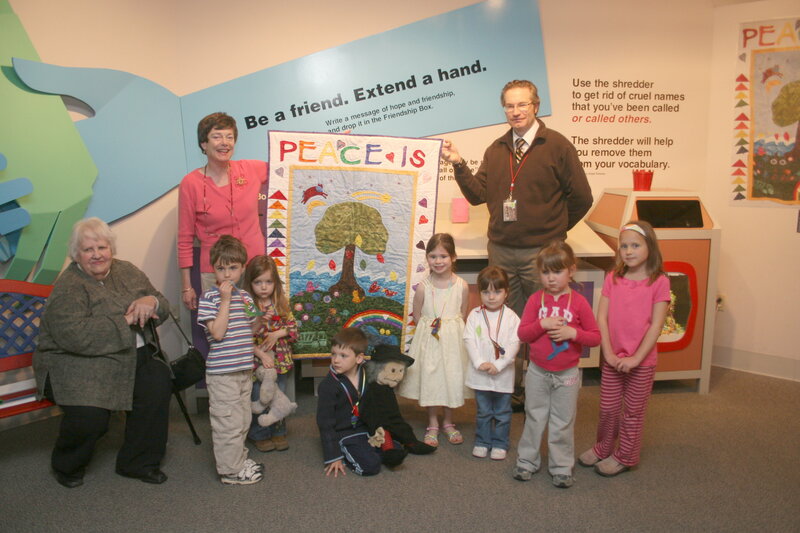 With the help of a beloved classroom puppet named “Gloria”, Ms. Fitzkee inspired the youngsters to draw their ideas of “Peace.” Quilter Milly Cunningham used their illustrations of rainbows, happy animals and even trucks to create this beautiful quilt. The National Liberty Museum is grateful to Ms. Fitzkee and her students for this wonderful gift. And so, we reveled in all the glory on our car ride home. We shared stories and wrote thank you notes over the next few weeks. We were truly humbled. The rest of the school year Milly continued to come in to visit and play with the children. Her bond was a strong one. Children loved her. They wanted to be with her and play. I stood back and watched magic happen – every time she visited. I sing all the time with children, often playing the autoharp. It’s a staple in my classroom. On one of Milly’s visits Gloria wanted to sing. We learned that Milly loves to sing! She joined us in a chorus of songs. Did you know that Milly’s favorite song is “God Bless America?” I did not. Well, the children were thrilled, as that is one of their favorite songs, too. The school year ended, and the following year Milly was a frequent visitor. Something different happened that year. A group of children loved singing “God Bless America” and often begged for the song. “Jennie, can you play it on your autoharp so we can sing?” I did, yet I always played and sang many other songs as well. This was becoming big, and I respond to big when it comes from children. That means I had to do something, do more. I did! And it turned into a pathway I’d never expected. Thank goodness Milly was there… stay tuned for Part 5.